PAUL DERVAN: Can a brand name be a substitute for superior product? Can a brand name be a substitute for superior product? Nobody doubts that companies that can bring some emotional appeal into their brands can strengthen their position. But can a strong brand name be a substitute for superior functional benefits? Hamel & Prahalad believe that the reason Porsche's US sales plummeted from over 30,000 in 1986 to just over 3,000 in 1993 was because it was living off their brand name far too long and the cars were not up to scratch anymore, compared to Japanese models. Adrian Ho has some wonderfully insightful slides where he explains that United fired their agency and decided to "invest in airline seats, not advertising". In product. Not brand image. As all marketers know, Innocent Drinks have mastered the art of bringing a personal, friendly face to their drinks. There has been loads written about them and their tone of voice. But Innocent are quick to point out themselves that while this is important, it would be foolish to think that clever, witty copy on their packs is a substitute for superior smoothies. They are adamant that they have the best product available. But I suspect they have enough loyalty to buy them time if another brand caught them off guard with a new superior product. Paul Feldwick shares a good example in his excellent book What is Brand Equity Anyway. Cadbury's Smash was the UK leader in the instant mashed potato market. 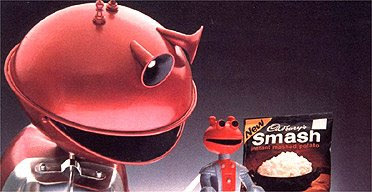 You might remember their Spash laughing Martian's advertising, with tag line "For mash, get Smash". They had built up a good reputation over some years. But in the early 1970s, a competitor, Wondermash, arrived onto the market with a clearly superior product, which would take a fair bit of time to imitate. However, because of the loyalty that Smash has built up, Wondermash had difficulty persuading consumers to trial their product. Which gave Cadburys time to improve their product without losing market share. So can a brand name be a substitute for superior product? Not in the long term. But possibly yes, in the short term. thanks Richie. Didn't know about it but just bought it on amazon.